Happy Chinese New Year! Grrrr! Update what happened during Chinese New Year period first before I start busy for next week mid term exam. Well, I went back on 11th February. Have my supper at Kepong foodcourt on the way back. Overall the food here are nice. A lots of food waiting for me at home. Haha! Dried meat, my favourite, ate a lot but still feeling not enough. A photo after come back from relatives house. Our lunch at Hutan Melintang on the 3rd day of Chinese New Year. Visiting teachers and friends house. The lion dance that wake me up on the second day of Chinese New Year. Visit grandma house on 4th day of Chinese New Year, a family photo with grandma. Oh ya, let me introduce my little cousin. Hey, that is ang pau, not char siew pau. Cannot eat! Her brother is playing with her. And guess what? We play paintball (actually is painball) on the 6th day of Chinese New Year! These are not M&M or any brand chocolate, is paint bullet. Have a meal and playing fireworks and firecrackers at my friend house on 9th day of Chinese New Year, a few hours before I going back to Melaka. I think the figure on the weighter is decrease since I sleep very 'early' during Chinese New Year period. Gonna take some actions against it. Finally we end our class on Wednesday, many of them went back to hometown today. Had a walk in Jusco, these are the things I saw today. 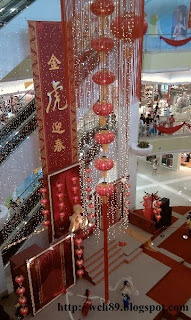 God of Fortune giving ang pau near the entrance. Gong Xi Fa Cai! Something was amazed me. 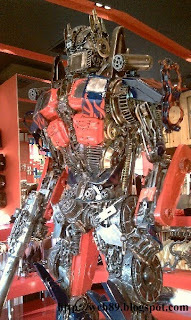 It is a figure from a apparel shop. 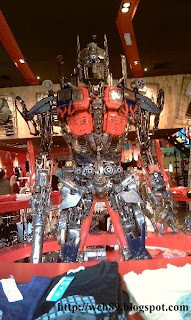 Optimus prime!!! It is so big! Long time I didn't eat this already. 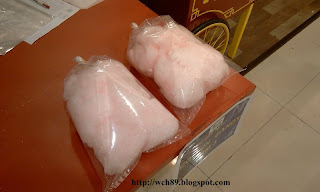 Craving for this. Some of my new stuff for CNY. Kingston Tiger year limited edition pendrive. I collect it this year again. I think I won't update my blog for the coming week. Happy Chinese New Year to all of you! High Committee of Japanese Culture Week. God of Fortune cosplayer from Chinese Language Society exhibition. On the same day, the Japanese Language Fair cooking workshop start at evening. Is time to cook! A cat get caught drinking pipe water. They made the love shape pancake, or I should call it pan-piece. Our official drink, Chrysanthemum tea for Cookig Workshop. Yukata class, which we teach participant on the way of wearing yukata and a photo is provided. Thanks ah Tong for helping us to snap the photo for participants. Group photo of that day. The busiest day of the week. 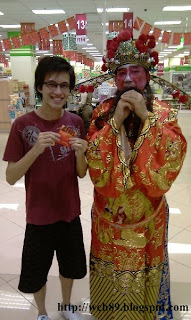 I need to prepare and present for lion dance performance in Chinese New Year Extravaganza. Straight away went back to Sri Ruby after the performance. They are having sewing class that time. International Business appreciation dinner today. The table for Sales and Promotion division. Some photo shooting after the meal. Manage to walk in Jonker with sensei of Japanese Conversation Class after the dinner. We saw a big lion head too!